A simple method for reversing migration order of enantiomers is presented. 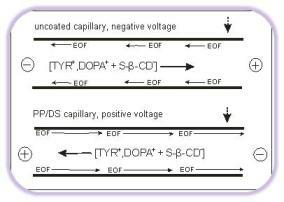 An uncoated and polypyrrole coated capillary modified with dextran sulfate (PP/DS) are used in the background electrolyte of low pH, resulting in different velocities of the electroosmotic flow. An enantioseparation of D,L-Dopa and D,L-tyrosine as model analytes is shown utilizing sulfated-ß-cyclodextrin as the chiral selector. Reversal of migration order was achieved in the two different capillaries by applying voltage of opposite polarities in each capillary. The best separation conditions were 0.02 mol.L-1 phosphoric acid (pH 2.0) and 2% S-ß-CD for both capillaries. A study of repeatabilities was done, showing better values for PP/DS (intraday below 2% RSD, interday below 3% RSD) than the uncoated capillary (intraday around 4% RSD, interday around 5% RSD). The approach could be applied to reversal of migration of other cationic or anionic solutes at low pH.